Malice is first encountered as she's fighting Serene in Lacrima Castle, and is mistaken for another demon. As a Diviner-wielder, it is soon revealed that she is a Grim Angel and was sent to Riviera for the sake of Asgard to actuate the Retribution - just like Ein and Ledah. She is the very archetype of the lawful evil; she is sworn to Hector, whom she refers to as her master, and she's set on her mission to serve his will. Like many things in the Dept. Heaven series, she borrows her name from Norse mythology: her name comes from Nidhogg, the Malice Striker. Nidhogg is the dragon who gnaws at the roots of Yggdrasill, the world tree, drawing the end of everything, Ragnarok, a little bit closer with each bite - the same role she has in the game. Her Diviner, Skadi, is named after the Norse goddess associated with winter, skiing, and bowhunting, which makes sense considering that Malice prominently uses ice as her weapon. In the original Japanese version, Malice's Diviner is named Toolus. I, too, am a Grim Angel. With my Diviner, Skadi, I am sworn to Master Hector. Nothing is known of her backstory in the game. However, Sting released a few discs of additional bonuses for Riviera; the Riviera Epilogue Disc contains a few audio drama tracks, and one of them focuses on Malice's past. Although these dramas are declared as not necessarily canon by Sting, they contain some information which could easily fit in. In Malice's case, it is revealed that her full name would be Malice Ructor and that she belongs to a noble family. Her father, Aleid, joined the faction of the demons that appeared near Heaven's Gate as their leader; these demons have in turn attacked her mother, Rizuna, inflicting her a severe injury. These events took place as Malice was still a child, and she was left to take care of her mother and herself. O omnipotent God. I won't be selfish anymore. I won't say I want to play with mother and bother her anymore, I won't say I won't eat the vegetables I hate anymore. So... so... Please save mother... Mother...! Rizuna eventually died, and Malice was left to her own devices. As an adult, she willingly joined Hector's forces and became a Grim Angel. If you're interested in this, Lacrima Castle has the Bonus Discs up for downloading; they also offer transcriptions of the audio dramas. This is the transcription of the Malice chapter. Another slightly different transcription is available here. The Dept. Heaven games all take place in the same universe, so some characters seen in one episode might reappear in some form in the next. There are two which draw inspiration from Malice: #367, from Yggdra Union, and Primea, also known as #549, from Knights in the Nightmare. This is #367 from Yggdra Union. She only appears in the PSP release of the game. As her codename implies, she is a test subject - more precisely, an early prototype of an artificial Grim Angel created by Hector. She wields a fake Diviner called Test Model Skadi II (Test Toolus II in the Japanese version) and she is voiced by Suzuki Mariko, just like Malice herself. Even her battle theme is very reminiscent of the Riviera soundtrack. While #367's design and background are a definite nod to Malice, the former's meek personality doesn't seem to match with the latter. 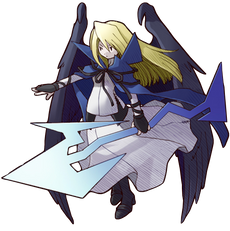 However, there is a surprise even here: #367 flies into a rage when fully powered up, becoming a lot like Malice in her final battle. Plus, in this state she resembles her even more: in a super saiyan-like fashion, her hair turns blond (shown on the right). 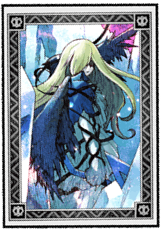 Another thing of interest is that the card she uses, Judgement Zero (on the left; note that the in-game version is tilted at 45°), features an artwork of a character who looks a lot like Malice. The flavor text of the card reads "The Words of Grim Angel Kirke." It is unclear if Kirke is the character portrayed on the card. If it is, perhaps it is yet another one of Hector's experiments - or perhaps even their progenitor. The card is an axe-type, probably as a nod to Malice's weapon. If any higher-resolution artwork of this card were to pop up, please let me know. And this is Primea, also known as #549, from Knights in the Knightmare. She is yet another of Hector's experiments to create a synthetic Grim Angel - a more advanced one than Yggdra Union's #367. Her Diviner is also a fake one, and is named Skadi Prototype (Toolus Prototype in the Japanese version). From now on, there will be major spoilers about everything in the game. If you are not ready, feel free to skip to the media, to the exit page or back to the beginning. In order to revive the golden age of the gods... Someone must become the one and only god. Only then will Asgard gain eternal power. That is what my master said, and his word is absolute. What Hector really wanted to do since the beginning was, of course, not what Ein and Ledah knew, as his plan was to become an absolute god; he ordered the destruction of Riviera because its holy power was the only thing standing between him and his plans. The mission of the Grim Angels consisted in reaping the souls of the Sprites of Riviera to unleash the power they received from the gods 1000 years before these events, and Hector was to use the collected power to revive the Sealed One Seth, a creature opposite to the goddess of Riviera Ursula, thus destroying her. He was the one to cause the reappearance of the demons; he ordered Malice to revive the children of the Demon God - the Accursed, summoners of demons - so to pose a threat to Riviera and justify the actuation of the Retribution; the souls of the Sprites killed by these demons were collected for Hector. Malice was only partly aware of Hector's intentions. What she knew was that Hector needed to become an absolute god to revive the golden age of Asgard and grant a period of peace under which the angels would have prospered. As such, she was more than willing to work for him. And here comes the most tragic part of Malice's character - to become a Grim Angel and receive her Diviner, she was asked to give up her future. If you consider the events of the audio drama as canon, she already was hopeless from the beginning, so she agreed. Picking up the hints that would appear in Yggdra Union and Knights in the Nightmare, both of which happen before Riviera in the Dept. Heaven timeline, Hector had been looking for someone like Malice for many years. She is test subject #1132, and she is perfect for his purposes. Malice is made a Grim Angel. As a result, she turned into a murder machine, unconcerned for anything but her mission, and did everything she could so that she could feel she had given a purpose to her life. continue reading: 4. THE GRIM ANGELS is this the will of the gods?